You have been hearing a lot about the different vegetables at 47th Ave, but did you know about the numerous animal species that call 47th Ave home? This season we have seen many birds, red-tailed hawks, moles, pheasants, voles, shrews, field mice, foxes, and we recently heard some coyotes yipping in the distance. We are all particularly fond of one bird whose loud call has made quite the impression on this year’s crew. This bird is called the Killdeer- it gets this common name from what it seems to say in its yell. Shrill cries of, “kill-deaahhh, kill-deaahhh” can be heard throughout the fields this time of year when the birds are caring for their nests and their young. Killdeer adults have a brown back and wings, a white belly, and a white breast with two black bands. The face and cap are brown with a white forehead. The birds breed in open fields (and even lawns with increasing habitat loss) which are often quite far from water. They lay their eggs on gravel by making only a slight depression in the stones. They do not line their nests so their speckled black and white eggs blend in marvelously with the background. The eggs themselves appear like stones. The adults display a very interesting behavior to protect their nests. They will feign a broken wing and distress call to draw predators away. Earlier this season we, at 47th Ave, saw many birds attempting to draw us farmers away from their nests. They have been mostly successful- especially since we are interested in the weeds near our veggies rather than their eggs. The only times we approach the nests are to place flags around them for protection. If there are flags around a nest we can make sure to avoid that patch of field when tilling. In this way we have attempted to protect the Killdeer population that uses our fields for habitat. I am happy to say that many of the eggs are now hatching with healthy baby Killdeer zooming about on their tiny legs. The youngest birds are able to move, but they depend on their parents to bring them food still. Killdeer eat mostly insects like weevils, many beetle species, and beetle larvae. As such, they can be helpful in protecting our crops from pests. Yet another reason why protecting animal habitat is better for everyone! With all this talk of change in the air, we figured it was time the farm website followed suit. Welcome to 47thAveFarm.com 2.0! As we put the finishing touches on this new version, I dug back and discovered that we’d launched the previous and original version of the site (pictured for posterity at right) around the time the Bush Administration launched its ill-fated invasion of Iraq in the spring of 2003. They chose swords, we chose plowshares … I’ll let you decide who made the smarter, more sustainable and healthful decision, but I think everyone would agree that the country’s a very different place than it was five years ago. If nothing else, it was time to leave George back in 2003, rotate to a fresh field and plant something new. In upgrading and redesigning the site, we had two overall goals: make it easier for you to use and easier for us to keep up. To address the former, we brainstormed a bunch of new features, some of which you’ll see described below. To make the site easier to maintain, we built it on the super-intuitive, open-source WordPress blogging platform, adjusting the look and functionality to suit our specific, farmy needs. We’re excited at all the new things it offers us, so take a look around and let us know what you think! Recipe index — just click on an item you received in your share and want to include in a dish. We’ll show you all the recipes shareholders have sent us that feature that item as a primary ingredient. Don’t see your favorite? Check out the guidelines on our Recipe page and send it to us! Search! 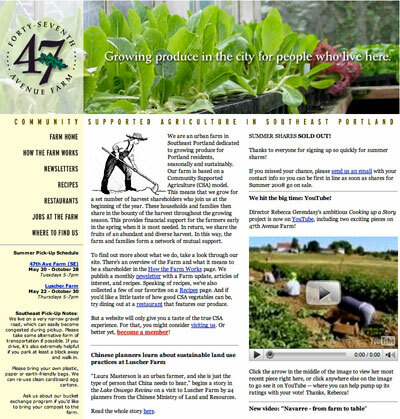 Now you can search the entire 47th Ave Farm website, including past newsletters and — did we already mention this? — recipes! Our farm plot locations in live Google maps — Check out our new Contacts page! Books we love — An ongoing catalog of books we’re reading or ones we recommend. Clicking the books takes you to that book’s page at Portland’s famous Powell’s Books online store — if you’re so moved to purchase it, the Farm gets a small commission. What better way to while away a winter night? Farm video! More timely links to audio-visual treats like Cooking up a Story and other video features on the farm or sustainable agriculture. We’ve collected a few of them here — take a look and pass the links to friends! Contributions by the farm crew — As you know, we couldn’t get all those delicious vegetables to you without the hard work and expertise of our farm crew. They’re the ones who really get their hands dirty (literally! ), so we wanted to offer some space on the site for their insights and reflections. Easier updating — In the past, we needed to go through some wonky web guy (ahem) for all the changes to the site. Now, using WordPress blogging software, it’s nearly as simple as typing, so it’ll be much easier for us to keep the site fresh and up to date. Better integration into the ongoing, online dialog about local, sustainable agriculture, food security, the joys of farming with drafthorses, and more! We’re looking forward to linking you to what other people are saying about food and farming, and we’re hoping others do the same to us. Conversation — Along the same lines, we want the site to be a meeting place where conversations can begin and flourish, so the new site will allow comments on applicable posts by registered users. Sign up and join in! Is that change you can believe in? Let us know!